Mnemonic is a fancy word from ancient Greek used to refer to a learning technique that helps us remember things. It’s common to believe that a good memory is something we’re either born with or not, but the truth is that there are a lot of things you can do improve your memory. This isn’t limited to learning languages of course, but that’s what we’re going to talk about in this article. Before we do that, though, let’s look at this TED talk by Joshua Foer. It’s an excellent introduction to what memory techniques are about and it’s also a good presentation in general. If you aren’t already familiar with the topic, the twenty minutes it will take you to watch his talk will probably be one of the best investments you’ve ever made. After listening, you can also read an article I’ve written earlier where I dwell more on the details of the TED talk and related concepts. Now, however, let’s listen to what Mr. Foer has to tell us about remembering things. Mnemonics are good because they turn information into a format that is easier to store and later retrieve. Learning something meaningless and devoid of context is very hard, and even if you can reach a certain degree of success by simply repeating something often enough, this is not very efficient. Therefore, try to stay away from rote learning as much as you can. If you want to learn something, don’t just hammer it in until it sticks, try to be smart about it and package the information in a way that your brain likes. In other words, use mnemonics. In general, learning new things is about connecting what you want to learn to what you already know. You have a rich experience of the world and a lot of information already stored in your brain. Learning then becomes the process of combining these things together in new ways. Mnemonics are about creating links that stick easily and are also easy to retrieve later when you need them. You have probably encountered many mnemonics in school already, typically to memorise lists that are otherwise hard to remember (also have a look at this xkcd strip about how to improve those). You can use similar principles to make it easier to learn Chinese and Japanese characters. As we have seen, most mnemonics deal with linking together facts in memorable ways, but that assumes that there are parts of a whole that can be linked together. If you look at characters as whole pictures, this is clearly impossible. In order to use mnemonics properly to learn Chinese or Japanese, you need to be able to break down what you want to learn into smaller bits. There is a relatively small number of pieces compared to the number of characters, so learning all the common pieces isn’t very hard. Mnemonics can then help you combine these pieces into complete characters or combine the characters into words. In order for this to work, you need to break down the characters properly, otherwise you will end up with pieces that aren’t useful for remembering other characters than the one at hand. If you’re new to Chinese and Japanese, you need to pay attention and see which components make up a specific character, you should never invent your character breakdowns. If you’re using Skritter on the web or iOS (we’re working on this for Android too), you can see how characters are broken down into smaller components and what these components mean. This ensures that you’re doing it right. If you’re dealing with words, it’s of course much easier to see the components of the word. 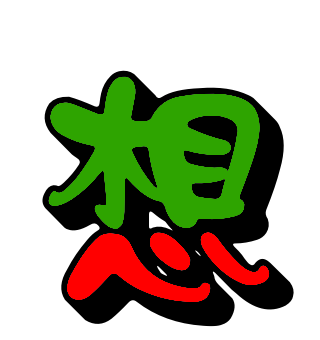 To give you an example, the character 想 (to think) consists of two parts, one at the top 相 (mutually, each other) and one at the bottom 心 (heart). The top part can be further divided into 木 (tree) and 目 (eye). You should never break this down in any other way. There’s more to write about how to create good mnemonics than can be fitted into this article, but we will still go over the basics. The idea is to link the parts you have together in a memorable way. Memorable usually means that the connection between the parts stands out in some way. They can be exaggerated, bizarre, disgusting, funny or scary; anything that helps your mind pay attention will work. Simply link the components directly to each other and form a picture. If we continue using 想 as an example, you can associate the three parts directly with each other. It’s pretty hard to forget the mental picture of a tree which has branches hung with eyes and hearts. Naturally, since 相 is also a character, you can also associate the meaning of that character and the meaning of 心, perhaps portraying thinking as the process where people mutually hold each other in each other’s hearts. Many words have built in mnemonics that are hard to forget. The Chinese word for “train” is 火车 (火車), which translated character by character means “fire vehicle”. This is already a mnemonic itself. A train is a vehicle propelled by the fire in early steam locomotives. Of course, not all words are so simple, but making up such stories/pictures on your own is very helpful. This brings us to the last piece of advice in this article, the rest we’ll keep for later. When you associate components with each other, don’t be abstract. Don’t think of a tree, a heart and an eye, think of a specific tree. See it. Smell it. Don’t just describe the picture verbally, feel it. That way, you are much more likely to remember the connections later. Creating good mnemonics is a skill that you need to learn. It will be hard at first and some of the mnemonics you create won’t be very good (create new ones), but as all other skills, practice makes perfect. Using mnemonics to learn also helps you understand how your memory works in general, which is a fascinating adventure in itself. In future articles, we will look more closely at mnemonics for learning Chinese and Japanese, stay tuned!